Each box contains 32 packs. 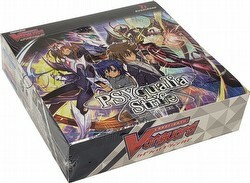 Each pack contains 2 cards. 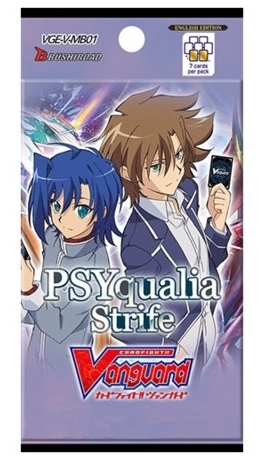 Cardfight Vanguard: PSYqualia Strife features the trump cards used for Aichi's and Kai's climactic battles, "Exculpate the Blaster" and "Transcendence Dragon, Dragonic Nouvelle Vague"! With reissued cards from the Aichi Sendou and Thoshiki Kai Trial Decks, both Royal Paladin and Kagero decks can be constructed! Every box will include either a VR or SVR! Also featuring Gift Markers with scenes from the animation, and reissued cards with different designs! Each box contains 32 packs. Each pack includes 2 random cards, one of which is a Rare or better or a Holo Rare Common card. There are 36 different cards in the set, including 8 new cards - 2 VR, 4 RRR, 6 RR, 10 R, and 14 C, plus 2 SVR Parallels, and 16 Gift Markers.